What a week!! I am so glad the weekend is here, the past two week has been dragging and crazy busy. My skin has also been going through some serious hormonal changes - I'm not too sure why, but I literally broke out over night with hundred (exaggerating here) of small pimples on my forehead which later trailed down my face. I'm guessing it's stress related. I was able to use products to help calm my skin down and sit through the breakout. Luckily I had some high tech products to help me out. Mesoestetic is a part of Advanced Cosmeceuticals, a Western Australia based provider of premium skin care. They provide products and equipment to medical and skincare professionals such as Dermatologists and Plastic Surgeons. Daily cleansing mousse with a light texture to purify and cleanse blemish-prone and seborrhoeic skin. This is possibly the best cleansing mousse I have used to date. You may have read from my previous posts regarding my dislike towards mousse cleansers... my skin is dry and mousse usually dries out my skin. Well, this cleanser is different, it's like nothing I've used before. Following a cleanse with Mesoestetic's Purifying Mousse, I feel that it left a hydrating layer, preventing my face from drying out. My extremely dehydrated, I often get mistaken for having oily skin - it's actually ridiculously dry, peels with occasional hormonal blemishes. This cleansing mousse left my face feeling very hydrated and didn't do a bad job at ridding my makeup either - just remember to avoid eye areas! The only con is the scent, it smells like a very strong toothpaste?! Not my favourite but I think I can get use to it. Exfoliating and purifying facial mask for blemish-prone and seborrhoeic skin for weekly use. Provides mechanical exfoliation and cellular renewal for optimum control of oily skin. Use weekly on clean skin, avoiding contact with the eye contour and leave on for between 5 and 10 minutes. Massage in gently so that the micro particles can sweep away impurities. Rinse. Another high quality product. This is possibly my favourite out of the three Mesoestetic products. I have been using the renewing mask on a weekly basis for a few weeks now and it's been doing amazing things to my skin following each use. My skin feels smooth and clean ... like every single pore on my face has been cleaned out. When I went to Dermalogica to get my face mapped, I was told to avoid regular exfoliation due to my dehydrated skin. So I really like the fact that this is an exfoliating mask, I gently exfoliate when applying the mask onto my face and leave the mask on for about 10 minutes before rinsing. The mask itself is very gentle and great for sensitive skin. I love using this mask before an event or applying makeup, my skin feels plump and my pores appears a little less visible. This is a mask for people of all skin types and I dare say, among one of the best masks I have used. Specific, local treatment for emerging or rebellious blemish breakouts. The innovative pigments in the formula have a modulated, progressive, concealing effect controlled by the movements made during application which make it possible to adapt the treatment to different skin tones. At the same times, the complementary effects of the components of m.acne complex™ quickly reduce redness and swelling caused by blemishes. Locally apply a small amount of imperfection control to clean, dry skin, using gentle circular motions to build up the colour and evenly cover the affected area. It took me while to get my head around this product. I wasn't sure whether it was a pimple treatment product or a concealer. This Imperfection Control doesn't conceal like your traditional skin toned concealers. I've been using this everyday for a week and from my personal experience, I feel that this product blurred and mattified my blemishes, it doesn't erase redness. I have been testing this product on 2 of my giant pimples, one reduced after a few days of use - pus free; the other developed a very minute amount of pus and calmed with redness still visible. My pimples can get quite big, red and smooth, making it extremely difficult to cover as concealers/foundations would slide right off. I feel that my pimples are more easily concealed with makeup after a thin layer of Imperfection Control. I did see some of the pigments within Imperfection Control during use, the most visible was a reddish pigment. However the colour of the product itself is white and pretty much applies somewhat opaque. It's so difficult to capture a before/after photo, but above is a part of my nose, if you look past the freckles you might see some little patches of redness, those are small pimples - there's also a little bit of shine on my nose. 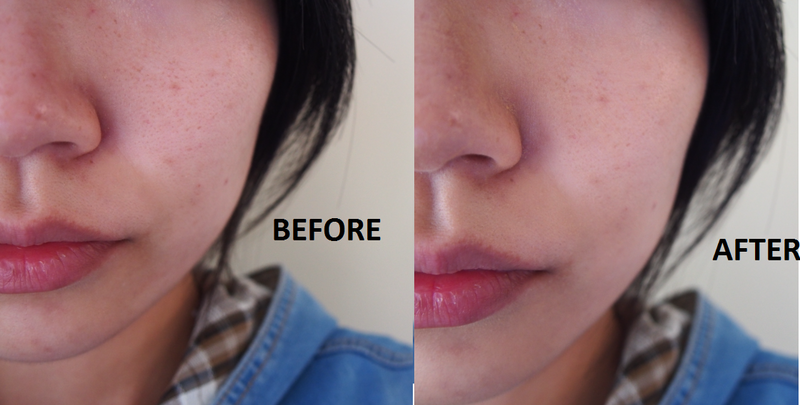 Once I applied the Imperfection control, the surface of my nose became matte, smooth and pore free. I am still yet to work out whether this is the effect that I am suppose to experience, I have been applying the content in circular motions but can't seem to maximise the effect of the pigments. OVERALL... I am very pleased with Mesoestetic, although I feel that I need a bit more time with the Imperfection Control as I don't feel that I am experiencing the full effect. I can understand that Mesoestetic is a little bit dear, but I can see why, it's high quality. My week has been bit of a roller coaster, reaching it's highest highs and lowest lows. My parents told me I need to consider having babies soonish - having kids!? I'm a kid myself!!! I still say things like "When I grow up I want to blablabla"... my partner and I often talk about which superhero we want to be.. I don't think I'd be quite fit to procreate. Heavy topic isn't it? It's just been a week where I need to rant, from life stress to work stress. I'm sure we all have one of those weeks! But you know what, nothing makes me more happy than coming home to makeup and packages. As soon as I see a package waiting for me on the table, I'd literally forget about whatever trauma I experienced that day. Beauty therapy should be a thing. It would've been interesting if I ended up using my Psychology degree, can you imagine? Every therapy session would be a makeup session. - Contains a bi-phased formula pairing nourishing lip oils with pigments for plump but natural looking glossy lips. - Nourishing oils contain sweet almond oil, omega 3 and cranberry oil. - The cushion applicator allows the absorption of the right dose of pigment while the shape hugs the lip contours. - The formula is non-sticky and non-drying. - Juicy Shaker comes in 13 shades with one limited edition shade "400 Mint to Me" (the blue one!). - To apply, shake your juicy shaker, the more you shake the stronger the colour gets. Can you see the oil separated from the pigment? Let's start with the application, I love the fun, fresh and fruity concept, it's like a mini cocktail in a lip product. It's interactive in the way that you have to shake your little concoction before enjoying it. Juicy Shaker is a novelty that really brings light to my day. No, seriously, on days where I'm angry, I just shake my juicy shaker and literally "shake it off". The sponge tip application is another novelty, I've never seen an applicator quite like this. It's soft and really does hug the shape of my lips. The slightly pointy tip allows easy application around the edges of my lips. My Juicy Shaker in "Berry in Love" smells fruity and slightly alcoholic... like a berry cocktail! Is it just me or did anyone else smell the cocktail nature of their Juicy Shaker? Upon application, my lips felt super nourished with a gorgeous tint of colour (a purple-ish shade) that didn't come out too well in photos ... but it's actually a bit darker in real life and fairly visible even on my lips that's relatively pigmented. I did had to reapply after a couple of hours for a colour boost, and my lips did feel a little bit dry once the nourishing oil dried. Overall, I feel that it is perfect for everyday wear, I like my makeup minimal most of the time and a gentle tint and beautiful shine is perfect for me. If you are looking for a gentle, fun and novel lip tint, check out Lancôme's Juicy Shakers! I am beyond tired and still recovering from my week in Singapore and 2am flight back. Unfortunately I have sacrificed my Saturday to attend work related training so I am feeling a little bit restless. Nonetheless the training was on environmental modification (i.e., when health professional come together with builders and architects to design a suitable home/public environment for those is a disability) was extremely informative and worthwhile. Even though my mental and physical state is completed exhausted. My skin is looking pretty darn good! I was lucky to receive Boots Laboratorie's Optiva range to trial, I've been using this for a few weeks now and I'm ready to deliver my verdict! Oh and I recently purchased the little blue giraffe clip (see above), it is just too cute not to be in photos!! A gentle foaming wash that leaves skin feeling fresh, clean and invigorated with a healthy glow. I am sure that I have mentioned this in my previous posts, that I am not a massive fan of foam cleansers (unless I use my Shiseido cleansing brush) simply because it spreads very easily and get caught in my hair sometimes. I also find it difficult to breath with the foam around my nose. But if I am in the shower, foam is great as it reminds me of the bubble baths I use to have as a child. I usually find foam cleansers quite drying, but this particular cleansing foam was surprisingly moisturising. As for makeup removal, the best way to get bits off your face is with a cleansing brush. A refreshing toner to comfort and hydrate the skin. It's been a very long time since I've used a toner that is not a spray or a mist. I've been using this toner day and night (although I have skipped a few mornings, it's hard to keep up the skincare routine during work days!). I like to pour some of the toner onto my hands and apply it on my face as if I'm a man patting aftershave on. I dislike using cotton pads because I don't feel it's economical! A lot of product wastage in terms of the toner and cotton pads. I found this particular toner to be really quite pleasant, it has a floral-ish scent and did not irritate my skin. The toner is quickly absorbed into my skin after application to provide an instant boost of hydration. A concentrated skin hydrating serum with a light weight formulation, easy to apply and works deep into the skin. A lovely light weight serum with a subtle sweet scent that dries fairly quickly. I use this after my tonic and the pair works together wonderfully, my skin feels amazing and incredibly hydrated! The serum does not roll off my face nor does it irritate my skin. I have been using it slightly under my eyes just around the orbital bones, this works for me, however if you have sensitivities, stick to your eye cream! This serum also works really well with Optiva's night cream! A hydrating lightweight formula suitable for oily skin and combination skin. This is a light weight day cream with SPF 15+. I usually opt for SPF 30-50 +, however this day cream had come in especially handy in the past week. I've been doing more time in the office than on the road, so I felt that SPF 15 was sufficient. Otherwise I often put another layer of SPF on top of this day cream. There is a nice subtle scent to this day cream, which is again relatively floral and quite pleasant. I honestly don't have anything bad to say about this product other than the fact that I personally need more than SPF15 because I spend a lot of time outdoors for work. A rich moisturising cream that absorbs easily to help restore skin overnight. Has anyone tried this night cream? I have never tried anything like this before, the consistency is fairly thick and heavier than the other Optiva products, although still easy to blend. Less is more with this product, if you put too much on it'll slip off. The product has a rather medicinal (?) scent, I really can't describe it but I'm not a big fan of the scent (I did get accustom to the scent over time). BUT, once applied, the night creams gives off a fantastic cooling sensation. I am notorious for using pimple cream on large areas of my face for that reason, it helps calm my skin down, or that's what my inner voice tells me. I love the cooling sensation, I noticed a lot less redness around my nose (which is usually red, I also pick my face.. oops). Prior to using this night cream the redness on my face would last for months on end, but I personally feel that the redness is easing a lot faster with Optiva's night cream. In addition, I have dry skin, so I found the consistency to be perfect. I do love heavy night creams. A part from the scent, I think this is a very unique product! Overall, Optiva's range worked quite well for me, especially since I have dry skin - I can see how the entire routine may feel a bit heavy for those with oily skin, however when products are used individually, it suits all skin types. The only thing I'd change is the scent of the night cream. My skin felt pump and extremely hydrated following my use in the past month. This is a great and affordable range, I've seen Optiva advertised in a few pharmacies, have a look if you are passing by! Time is going crazy fast, I can't believe it's May already and Mother's Day is just around the corner. The first Mother's Day present I had ever purchased was an empty jar with painted flowers from a school market while I was in primary school. My mum had kept the jar ever since. I always feel guilty when I get annoyed at my mum or when we get into a fight, it always ends up in regret because deep down I know that no one in the world cares about me more than mum. So whether you celebrate Mother's Day or not, provide her with all the love that she deserves - it could be a simple brunch, a present or bonding time, make sure you cherish her. If you are looking for the perfect Mother's Day gift, this post has got you covered! Balenciaga have created the most beautiful fragrance to gift all mums this Mother's Day! B. Balenciaga Skin has the most elegant packaging and pleasant scent. It is simply yet exquisite. B. Balenciaga Skin is available in 30ml ($100), 50ml ($150) and 75ml ($180) from Myer and David Jones. With the cooler weather approaching, give your mum soft beautiful hands with Jurlique Beautiful Rituals Hand Cream Set, this set comes with a citrus, lavender and rose hand cream at 30ml each. You can also check out Jurlique's body and face Mother's Day gift sets here. Jurlique's Beautiful Rituals Hand Cream Set is available for $50 on Jurlique's website below or Myer and David Jones. If you can't get to Myer or David Jones in time and you live closer to Priceline, don't fret! Lanolips have a very impressive and affordable hand cream box set for you to gift wrap. This trio gift box contains rose hand cream intense, lemon hand cream intense and rose hand cream everyday, all 25ml each. For coloured nails, OPI is your go to brand. We are absolutely loving OPI's soft shades for 2016. Instead of your usual burgundys throughout Autumn, add some soft pastel shades on your nails. Check out OPI's complete soft shades range here. Does your mum love nail art but can't find the time to create a masterpiece on her nails? Jamberry is possibly the highest quality nail wraps I have tried to date. With over 300 designs available on their website, you won't be disappointed!! After all that nail polish and nail art, surely it's time to give your mum's nails some TLC with Revitanail's brush on nail strengthener, nourishing oil and keratin strengthening serum. For perfect nails, a treatment set is a must! Mum's a hair person and a sucker for rose gold? Check out this stunning beauty tool-kit from Remington. This Shine Revival Dryer Set includes a triple infusion technology (keratin, argan and ceramic) dryer along with some essential styling products such as a round brush, Osmo Berer Oil Shampoo and Mask, sectioning clips and a beauty pouch for safe keeping. This entire set is available for $69.95 at Target, Harvey Norman and Myer - what a bargain! In the past few years, I always managed to put a body butter or lotion into Mum's gift packs. This year is no different. Here are two body products from Jergens, Shea Beauty Oil and Hydrating Coconut Milk (how good does that sound!). It's not Mother's Day yet, but my mum has already got dibs on the Coconut Milk! I think Lush has made it's mark in bath products. Mum and I both love Lush, we lined up for 40 minutes during their Christmas sale and it was well worth the wait. My boyfriend is also crazy about Lush products, so every time I go to Lush I need to buy a trio set, one for me, one for mum and one for the boy! Lush always has products to suit and match all holidays/celebrations (including Halloween - which is my personal favourite). Here is just a few products featured in Lush's Mother's Day catalogue. DISCLAIMER: A MASSIVE thanks for all contributing companies to make this post possible. All products in this post were provided for this exclusive Mother's Day feature. This post would not have been possible otherwise. A pinch and a punch for the first day of the month! I recently got back from my holiday (a post will be up soon-ish!) and I am absolutely exhausted, 2am flight back to Australia in extremely uncomfortable plane seats was a bad idea. I barely got any sleep. Even though I've slept for many hours today, I still feel extremely fatigued and weak. Good thing I pre-wrote most of this post (that's not cheating is it?) and edited a few dot points in my verdict as I took the sculpting powder to Singapore with me. Alrighty, lets have a look! Shimmery powder to contour the sides of the nose, jaw line and hairline. Soft shimmer powder to highlight the cheek bone, browbone, forehead, center of the chin and bridge of the nose. Currently only available in 1 shade which is Coral Glow, but I am aware that there is a palette for those with darker skin tones. I have a love hate relationship with this product. I have light to medium skin tone and it doesn't really show up on my arm (as you can see in the pic above). This product does show up on my face, when applied with a brush. It gives me a very gentle contour/bronzy glow. The highlighter is very subtle also. Being a minimialist, I actually quite like the result on my face. I did try to build up the contour and the result was not pleasant! You can really notice the shimmer and my face ended up looking rather muddy. There seems to be quite a substantial amount of fall outs when I swerved my brush around the pan to pick up products initially, once I used up the top layer of the kit, the fall out was minimal. The bronzer lasts all day while the blush disappeared half way through the day. I recommend this product for those with pale to light skin tone, you won't get much of a colour pay off if you have medium to dark skin. Keep your eyes peeled! I have actually seen this palette with darker and more pigmented shades designed for medium/dark skin online. Let's hope it will be released here in Australia! Silly me initially thought this product was a tinted moisturiser/BB cream type base. I thought to my self, geez, it's not giving me a whole lot of coverage. I can still see some of my freckles. Later on, I found out it's a primer and my perception shifted significantly. During "good skin days" I often wear this product on it's own as it will cover most of my smaller blemishes and minimise the size of my pores pretty well. I feel comfortable going into the outside world with #instaflawless on. I don't know if you can tell from the before/after pics above, but my skin looks smoother after application. Recently I decided to use this product as a tinted moisturiser, I personally feel that it's too much under my foundation yet works better than most of my BB creams and tinted moisturisers!! When used independently, the product is not heavy or tacky. It's actually very moisturising and smooth.